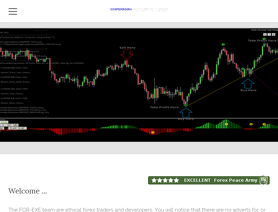 At www.for-exe.com we share the tools that we've developed for our own trading needs. We don't sell indicators and expert advisors just to make money from 'wanabe traders'; we provide what's good enough for us to be successful traders. Everything else is available for free or a negligible cost. This will become your trading best friend. The perfect swiss knife. This piece of art is truly stupefying. I do not remember the time when I was a kid and used to have training wheels on my bike, but this must have felt like this. - best support and resistance feature I have ever seen. Properly designed, as it should be. Not as you can see on most retail traders forums. This one, will make you raise an eyebrow. - excellent supply and demand feature, in the very top of the basket. - very accurate and clever interpretation / application of Bill William's principles in terms of waving. Always be sure to be on the right side of the trend, without effort. Identify the impulses and the corrections at a glance. - Are you an Elliott Wave analyst? Just add this to your chart to make sure you're missing anything and improve your edge with the confirmation that what you see is the same as the computer itself. - You struggle to decide where to take profit? This tool will show you where it will likely go or stall. Or even reverse. - impressive trendlines feature, which, like the support and resistance one, has been designed in a special way that will make you scratch your head and think: why have I never noticed this before? - Fibonacci is fully integrated. Let me repeat: Fibonacci is fully integrated. Retracements, extensions, expansions, and, wait for it, even a fibonacci level cluster calculator that you can customize to find high probablility targets or reversal levels (this is mental). - Do you want to backtest it to see how it behaves in real time without having to wait for a week of live price action? No problem. Just two clicks away. - big round numbers? Integrated. - the whole thing is pretty much completely customizable to your liking. - as if this was not enough, you have the option to find harmonics patterns. They're drawn for you. And if you see one specific pattern that you like better than others, save it and wait for it to pop-up again. - All of the above combined on one chart, and you have the best possible confluences you can hope for. Worried about a cluttered chart and paralysis analysis? Just disable what you use with a simple click. - I'm sure I'm forgetting other features. Also, I have been asked to find anything that could improve it, and I could not think of anything so far. It's all there. Now, the training course. No BS, no unnecessary bla-bla, straight, clear and to the point. Plenty of videos to explain how everything works, from A to Z. Concise and very solid. Live trades as well, which support the efficiency of the tool. Hundreds of examples are provided so you can study them and find what works best. You can not ask for more in terms of education. Have a look at the blog too, if you want, before making a decision. You will see enough to make up your mind. Customer service is impeccable. The owner and coder is amiable and genuinely at your service. I have set things up for me very quickly during the weekend whereas I had people over. I've been trading for 10 years and I was not doing too bad, but this is a true game changer. Like an autopilot. Will you make 100% winning trades? Certainly not, but with patience and observation of the most successful patterns, you can get close to it. To anyone who will use it, enjoy, keep smiling, and share your discovery to people you care about who is also trading. To anyone skeptical (this is totally normal after all, I even think my review is over the top in terms of enthusiasm! ), Have a look at the free indicators, they will give you a hint on the seriousness and skills of the owner. He even fixed one for me that was giving me trouble because of my platform! I have tried so many different indicators and systems ... I only wish I could have found this one earlier. eWavesHarmonics & Advanced Trade Manager: A price-action trading toolbox and bespoke trade management at their best. Advanced Trade Manager (ATM) has been my trading companion for a year now and it is without doubt the most purposeful and intuitive trade manager I have used. Apart from the automatic trade function, which effectively makes it two products in one, I have used its entire array of useful features at some time or another. It feels so easy to use and because of that I want to say that ATM is so very good at the basics; ‘click and you’re done’. Therein is the deception! Like any expert (pardon the pun!) ATM makes it look easy; reducing some complex, multi-button-pushing, error-prone tasks to a simple click. It couldn’t be easier. The last thing one needs in the middle of a trade is to have to dig deep into a program’s settings to alter a parameter, and that’s if it lets you. If you must, ATM allows this to be done on the fly. By example, just the other day a trade had exceeded my expectations and I wanted to move my stop-loss to break-even, take off a larger percentage than normal (66% not 50%) and then, at a specific level, begin trailing using a fractal. It was all done in seconds with a few clicks. The big, BIG point here is that one doesn’t want to do the same thing every time, one wants to act in a bespoke manner, suited to each, unique trade and ATM allows this. Owing to its level of capability and the excellent user interface, ATM feels as if it is part of me and the trade as opposed to an external element to worry about. In the good sense of clutter-free, price-action trading the interface can be minimised to its three, unobtrusive control tabs, keeping the trading screen clear. I don’t use the automatic trading function but Steve provides ample, online instruction for it along with the user guides for ATM. As with eWavesHarmonics Steve steadily evolves ATM and customer input is actively sought. Reading the other reviews here reveals you could not be doing business with a nicer man for a better product. It’s a big thumbs-up again from me, this time for ATM. Feb 28, 2019 - 5 Stars eWavesHarmonics is much more than your average indicator. It is a ‘price-action trading toolbox’. eWavesHarmonics and for-exe.com have worked for me on many levels and I have remained consistently profitable since I began using eWavesHarmonics in April 2018. I have found the customer service extremely helpful, educational and prompt. This is the first time I have invested in an indicator like this. For me the immediate attraction was that it is easily comprehendible and usable. If you sensibly integrate its elements, with your own trading knowledge and skills, honed from the education portal, it will help you make a lot of money. Its very reasonable price is an irrelevance in the shadow of the money you can make using it. I am still increasing my trading skill as I get more familiar with it. It grows with you, offering the tools needed to give confluence and therefore confidence to your trading setups. Its signature eWave 4 trendline break will offer you ample entry opportunities, with the benefit of supply and demand zones, support and resistance levels as well as Fibonacci levels and more ...all adding confluence to any trading setup decision and all calculated for you. Moreover, these tools allow exit levels to be plotted well in advance of entry. 1: Psychologically relaxing; my trust in the probabilities has rocketed as time and again scenarios play out. 2: Managing my trades and choosing profit-targets with less angst and more satisfaction. There are many more ways to utilise the indicator’s features and the education portal is there to fine-tune one’s price-action knowledge and explain how to best use the indicator. This gets a big thumbs-up from me in all respects. In first place I would suggest eWH and ATM - 2 best tools I have ever used. On top of that Steve has created great course with his method how to see and trade any market. The approach is amazing and providing you with great knowledge to better understand overall market behaviour. You will have lots to learn but when you finish you be shocked how well you can see the market compared to what you did before. Very happy with this course, and the eWave Harmonic indicator helped me to setup all my trades. Thanks Steve for your great work. By far the most comprehensive and essential trading course ever. No matter what you trade. There's nothing like it. I don't know what to say about this course, only that I think Steve is giving it away far to cheap. After having gone through two coachings, which lasted serveral months to one year and each costing somewhere between 5 and 10K this course boils down to the necessary essentials of trading. Of course you can read books on each of these topics, which I did, but Steve gives you the essence of what's needed to apply that stuff in real trading. I've yet to get into the eWave Harmonics Indicator, which is a very powerful tool. Don't underestimate it, but you will not get to it's full potential without knowing exactly how read your candles, find support and resistance and so forth. If I only had known about this earlier. Would have saved me a ton of money and loads of bad trades. Increadible accurate trading tools for money management and technical analysis. Elliot Wave tool is great. I bought this system three month ago. I am very satisfy with it. It give me a clear enter signals with a good R:R trades. I make a lot pips during this time. What to say more. I can recommended it to all traders who wonts to trade professionally. I am really happy with it. The previous review was a complete misunderstanding on my side, I had purchased the eWaves and was using the installation instructions from another program. Steve contacted me and we resolved this matter. I am now only beginning to use this program but judging from the assistance I received from Steve and the comments from others I believe that it will only get much better from hereon. Mar 20, 2018 - 1 Star Purchased the eWaves, tried to install would not install on my MT4 platform. I tried to contact the suppliers and no response whatsoever. Have you seen the new web page that I made on MT4 Tips and Tricks (see my last blog post). That covers MT folders. You didn't reply to my email, so I couldn't help you any further. Hundreds of people have installed eWaves on their MT4 platforms without any problems whatsoever. I think the problem is on your end, it's not an issue with eWaves or the service that we provide. We'll do our best to help with installation problems but there isn't a great deal that we can do in supporting local PC issues.